For a limited time, askHRgreen.org is offering free pet waste stations through a new grant. If your Hampton Roads neighborhood / HOA / community association is ready to make scooping the poop a priority, then you’re invited to apply. 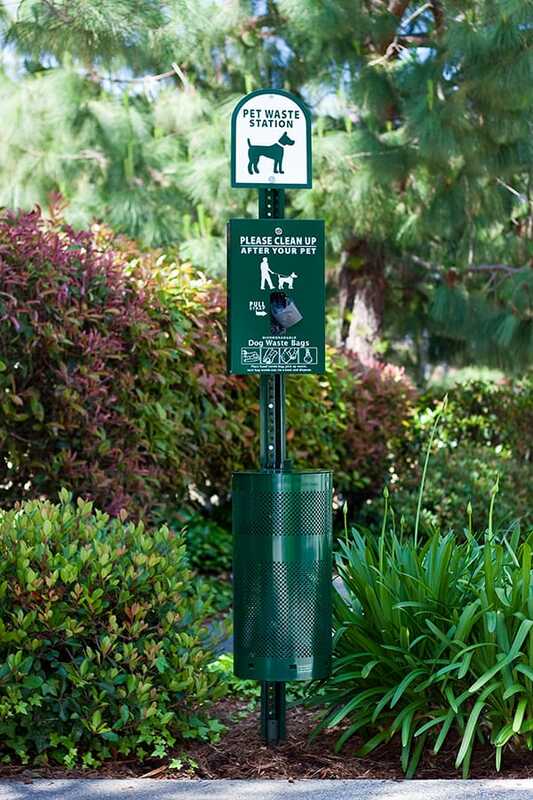 Pet waste stations encourage residents to pick up after their pets by making it easy and convenient to do so. Scooping the poop is not only important for a clean neighborhood, it’s important for our local waterways. When pet waste is not picked up, it becomes a major source of pollution in our water. Rainwater carries nitrogen and bacteria from pet waste into our storm drains and directly into our rivers, lakes, and streams. This excess nitrogen and bacteria transform the water into a cloudy, green, foul-smelling mess that lacks oxygen and becomes an aquatic dead zone. The same pollution is responsible for beach closures, fishing restrictions and warnings on eating local seafood. Installing a pet waste station is one easy way to combat water pollution in your community. Apply for the pet waste application grant online. Applications will be accepted as long as pet waste stations are in stock. Supplies are limited, so apply today! This grant is open to any neighborhood, community group, or property management company with the ability to install and maintain the pet waste station. We give you the station, you keep it up! All neighborhoods, community groups and property managers in Hampton Roads with the ability to do the following tasks are encouraged to apply for a free pet waste station. Install the pet waste station within 45 days of receipt. Use some method of advertisement to promote the installation, purpose and use of the pet waste station to the residents of the neighborhood. Pet waste bag replacements are purchased in a timely manner (First 400 bags included with grant. Refills must be purchased by the applicant). Garbage can liners are purchased in a timely manner (First 25 can liners included with grant. Refills must be purchased by the applicant). We would love to hear how your pet waste station impacted your community! Email us at hrgreen@hrpdcva.gov to share your neighborhood’s experience with the pet waste station grant. Photos are encouraged. Include who will be responsible for monitoring the station and emptying the garbage can, changing the liner, refilling the station with bags, etc. ?, How will refill bags be purchased? How often will station be checked? Would you like to sign up for askHRgreen's e-newsletter? Would your neighborhood be interested in other educational resources provided by askHRgreen? By signing below we acknowledge that our neighborhood organization (HOA, civic league, etc.) or business (property management company, rental property company, etc.) is committed to completing the routine maintenance items listed below. We also acknowledge that failure to perform such maintenance will be grounds for removing the pet waste station. The City/County may remove the station at any time due to lack of use and/or failure to maintain the station. By signing below the applicants agree to the following: • Once the pet waste station is distributed to the neighborhood, it must be installed within 45 days. • Applicants will use some method to advertise the installation, purpose and use of the pet waste station to residents of the neighborhood. • Once installed, the pet waste station will be monitored regularly for the following items: • Garbage can is emptied when full • Pet waste bags are stocked and available for use. • Garbage can liners are stocked and available for use. • Pet waste bag replacements will be ordered in a timely manner • Garbage can liners will be ordered in a timely manner. • The city/council does not accept liability for injury resulting from the use of this station or improper installment of this station. Stations shall be used at resident's own risk. Application must be signed by two people (If neighborhood is a HOA, one applicant must be an association board member).